Racial tensions at the University of Missouri are bringing attention to issues that have been simmering on other college campuses for months, if not longer, amid a national discussion of race relations and treatment of blacks in America. The issues vary at different campuses, but many students say there's a common thread among campuses that can be inhospitable to students from racial minorities. Some are calling for more diversity among faculty and more spending on scholarships for minorities, as well as resources such as cultural centers. "You can't just bring students in; you've got to have faculty and staff members in key positions and you've got to be current," said Roger Pulliam, faculty adviser of the National Black Student Union, based in Whitewater, Wisconsin. Tensions flared earlier this week at the Columbia, Missouri, campus, where black students said school officials were not addressing racial slurs and incidents at the school. By midweek, the school's president and chancellor had resigned, and a Missouri college student had been arrested for making death threats against black students at the school. FILE - Jonathan Butler, front left, addresses a crowd following the announcement that University of Missouri System President Tim Wolfe would resign Nov. 9, 2015, at the university in Columbia, Mo. Nationally, students say the protests in Missouri are emboldening them to take a harder line. Black students at the University of Michigan, who make up only about 4 percent of the student body, have pressured the administration to boost diversity. If it doesn't happen, students said, they'll take a lesson from Missouri. "We will look to organize like Missouri students if the administration is not keeping their end of the bargain of what they promised," said Capri'Nara Kendall, a senior at Michigan. "We're not afraid to organize." 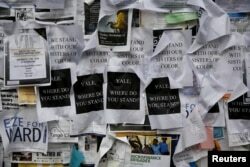 "It shows administrations that this is something that they need to take seriously," said Eshe Sherley, a senior at Yale University, where more than 1,000 people joined a march this week in solidarity with minorities. "It also shows students that the work they're doing isn't in vain." Meanwhile, campus unrest has spread beyond the University of Missouri, with students nationwide rallying in solidarity with their counterparts at Mizzou, as the school in Columbia is known. At the University of Wisconsin in Madison, hundreds of people gathered Thursday night to march in response to racial tensions at the Missouri school, local media reported. 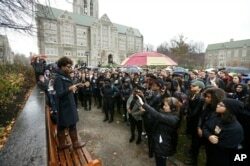 Students at Boston College listen to a speaker as they gather during a solidarity demonstration on the school's campus, in Newton, Mass., Nov. 12, 2015. Police estimated up to 600 people demonstrated, marching from the campus to the state Capitol, calling for support for the Wisconsin Black Student Union and other minority groups on campus, local television station Wisc 3 reported. Earlier this year, amid several widely reported cases of white police officers shooting African-American men, residents protested after a Madison police officer shot an apparently unarmed African-American teenager. In California, several universities held protests Thursday. The Black Student Assembly (BSA) hosted a rally on the University of California-Los Angeles campus, the student newspaper the Daily Trojan reported. Mykaila Williams, executive director of BSA, said Thursday’s demonstration was part of a nationwide effort of “student activists around the country who are wearing black to stand in solidarity with black students at Missouri,” the paper reported. 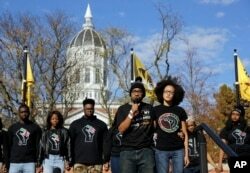 At UCLA, the Afrikan Student Union (ASU) and faculty members spoke to about 200 people about the similarities between racial issues at the University of Missouri and their campus, according to the Daily Bruin. Flyers on a college noticeboard on campus at Yale University in New Haven, Conn., Nov. 12, 2015. More than 1,000 students, professors and staff gathered Wednesday to discuss race and diversity at the elite Ivy League school. “How can we focus on studying if we know we are not valued in our everyday lives?” Kamil Oshundara, a UCLA student and board member of the Afrikan Student Union, said in the newspaper report. African-American studies professor Peter Hudson said black faculty are also subject to the microaggressions and humiliations black students face, according to the paper. He added only 3 percent of UCLA faculty is black. UCLA administrators said Thursday they would schedule meetings with the ASU to discuss a list of demands the group had sent the university last month. The list included such things as hiring more black faculty and implementing a policy explicitly outlining what constitutes discrimination to better detect racism, according to the Daily Bruin. About 150 students gathered on the Illinois State University campus in Normal, Illinois, Thursday, to express their concerns about issues related to the school’s minority students, according to the Pantagraph. Many students at the rally said they did not feel included in the campus community, the newspaper said. Among those speaking at the rally was Jessica Newman, a graduate student in higher education. “Mizzou is happening here, if you believe it or not,” she said, according to the Pantagraph. Boston College student Akosua Opokua-Achampong, of Lake Hopatcong, N.J., places her hands together during a solidarity demonstration on the school's campus, in Newton, Mass., Nov. 12, 2015. Illinois State University is in the midst of a campus survey, measuring attitudes and impressions of people related not only to racial issues, but also religious minorities, gender issues and the lesbian-gay-bisexual-transgender community, the Pantagraph reported. 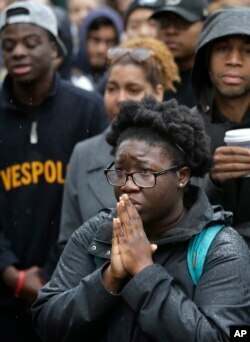 Several hundred students also gathered on Loyola University’s campus in Chicago Thursday. In a steady rain Thursday in Seattle, hundreds of students, faculty and alumni showed their support for the Missouri students. Race and safety were the two main topics students discussed at the protest, according to The Daily student newspaper. Mariama Suwaneh, a speaker at the event, said she hoped rally attendants walked away with understanding. “If you’re here today, that means you’re here in solidarity, in unity, and in togetherness,” she said, according to the newspaper. “When we’re united under one cause, we are so much stronger. And allies, today could be the day that you educate yourself because the black community is tired of re-living this battle. Today can be an awakening of solidarity,” Suwaneh said. At the University of Maryland in College Park, nearly 200 people gathered Thursday around a statue of Frederick Douglass, who was born into slavery but became one of the most important African-American leaders of the 19th century. Organizers said the rally was not sponsored by any particular group, but was a gathering of concerned students of color working to make their voices heard, the student newspaper, The Diamondback, reported. At the University at Albany in New York, dozens of people, including students, the campus police chief and the college's vice president of student affairs, discussed racial tensions on campuses nationwide. "The problem is much larger than the events in Missouri," Student Association president Jarius Jemmott said in the Times Union. At Duke University in Durham, N.C., more than 100 students, faculty and administrators gathered Thursday to show support for Mizzou protestors Thursday afternoon, the student newspaper The Chronicle reported. The rally, organized by four graduate students, was in response to protests at the University of Missouri and Yale University this past week. However, the paper said students also noted the growing frustration with the administrative response to acts of intolerance at Duke. Several speakers at the rally mentioned recent acts of bigotry on Duke's campus, including the defacement of a Black Lives Matter poster and a death threat directed at a gay student, The Chronicle reported. Some students also shared stories of racism that they have encountered on campus. The Missouri protests also have led to some schools to address similar concerns on their campuses. University of Alabama President Stuart Bell and Elliot Spillers, the president of the school’s student government association, on Friday were to discuss diversity and equity at the Tuscaloosa campus, the news website AL.com reported. Spillers told the online news website he wanted to address concerns of institutional racism at the school to prevent something similar to the student protests at Missouri. And at Duke President Richard Brodhead, Provost Sally Kornbluth and Valerie Ashby, dean of the Trinity College of Arts and Sciences, were scheduled to address student concerns at a forum on Friday. Several other universities planned protests Friday as well, including at the University of Colorado in Boulder and at the University of North Carolina at Chapel Hill.